From the inimitable Mark Twain: "I never had any large respect for good spelling. That is my feeling yet. Before the spelling-book came with its arbitrary forms, men unconsciously revealed shades of their characters and also added enlightening shades of expression to what they wrote by their spelling, and so it is possible that the spelling-book has been a doubtful benevolence to us." Thank you for the expanded citation of Mark Twain, Mark; may I query one thing contained therein (it doesn't pertain to spelling). MT writes "Once when Clara was a little chap, her mother was away from home for a few days" — given the name "Clara", and the pronoun "her", I am forced to assume that Clara was female. But in British English, "chap" cannot refer to a female, only to a male. Was this not true in American English at the time that MT was writing, and if so, is it still untrue today ? 3. (Southern US) A child.
" But there's a decent joke at the end, "
No, there's not. 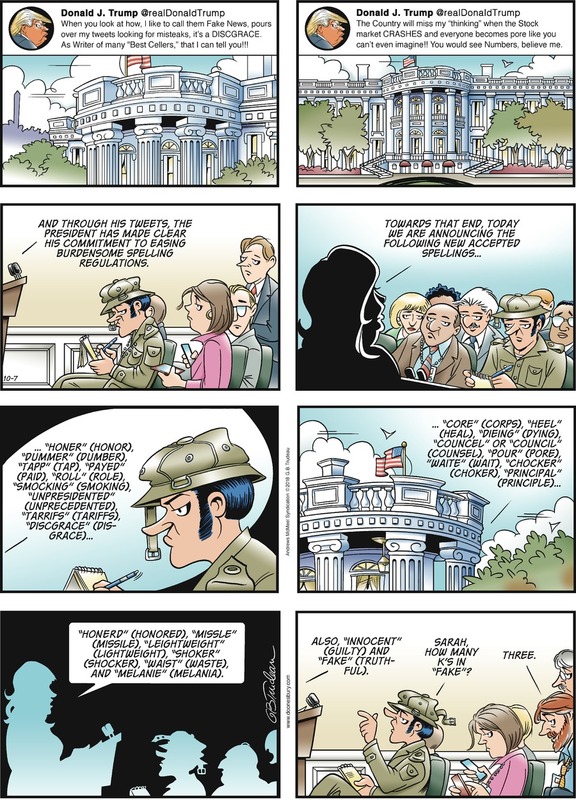 There's a casual slander at the end, written by an over-the-hill cartoonist who thinks everyone who disagrees with him is a racist. And everyone who can't spell is an untutored hillbilly. 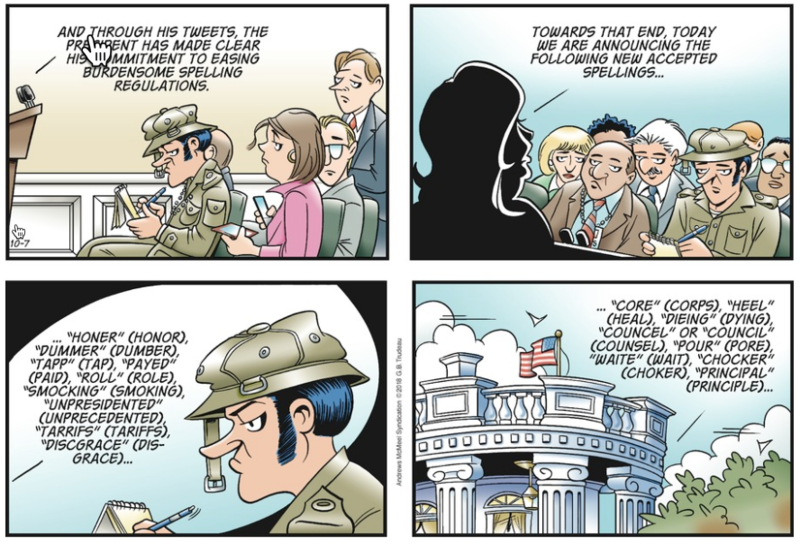 Is Gary Trudeau a real person, or a character from this episode (https://stuffwhitepeoplelike.com/2008/05/12/99-grammar/) of Stuff White People Like? what is the joke? i do not get the three Ks reference. In Faulkner's "The Hamlet," Flem Snopes gives Mrs. Armstid a nickel bag of candy "for the chaps," meaning her children. The novel was published in 1940, but this episode was based on the short story "Spotted Horses," published in 1931. The earliest instances in the google books corpus of "Amerikkka" as a politically-motivated alternative spelling for "America," which might be the fons et origo of this sort of usage, seem to be from 1972-73, which seems about right. One bit of very period rhetoric with that spelling goes on to denounce "the dictatorship of Emperor Nixon and his Republikan administration," which raises the question, why not "Republikkkan"? Faulkner would have been about a decade in the grave; Trudeau would have been in his mid-twenties. As I recall from my 70s memories, there was a prevalence of "Amerika" in leftist writing, which I took to be a reference to German (meaning Nazi) parallels. (Wikipedia entry on "Amerika" opines the same, citing support from Oxford English Dictionary, but I've not checked that myself.) Same might have carried over to "Republikan".